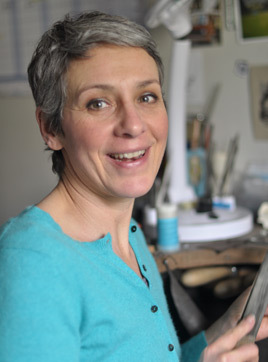 Henrietta graduated with a BA in Jewellery Design from Middlesex Polytechnic in the 80’s. Following this she spent two happy years working freelance as apprentice to Wendy Ramshaw. with further part time work in the early 90’s. Her career continued to follow a creative route, and in 2004 she returned to her own bench to create the designs you see on this site. She now lives and works in Lewes, East Sussex. Her style is graphic, largely influenced by pattern and simple organic forms, resulting in designs that are pretty, elegant, modern and bold. She admires the Scandinavian aesthetic, with Sweden playing a big part in her life through family connections. Henrietta is delighted to have recently been selected as an associate member of the commended Designer Jewellers’ Group.